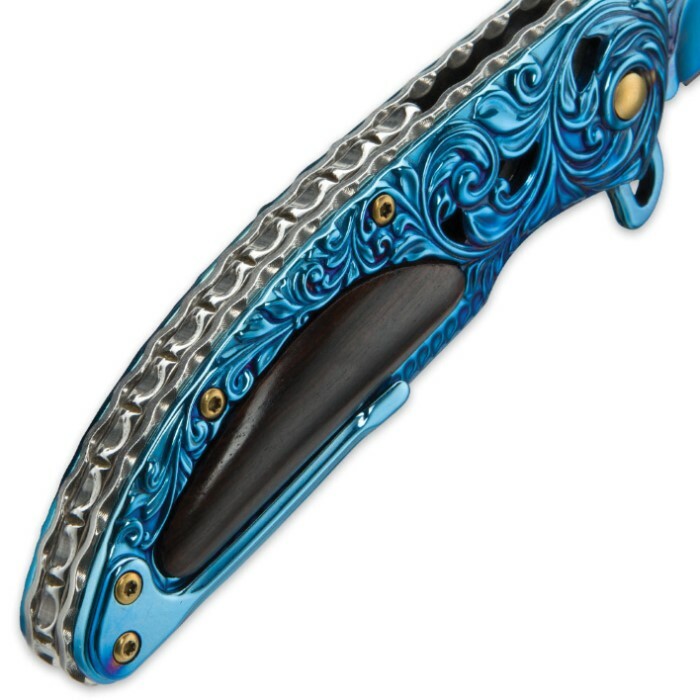 Kriegar Cavalier Blue Assisted Opening Pocket Knife - Iridescent Cobalt with Ravenwood Inlays | BUDK.com - Knives & Swords At The Lowest Prices! Kriegar's Cavalier Blue Pocket Knife features over-the-top elegance fit for a prince, with a price that's easily within reach of a pauper. The distinctive folder is not merely covered with a magnificent floral pattern; the breathtaking three dimensional lines and swirls of its classic vine motif actually comprise the very skeleton of the handle and blade spine! Even the liner and liner lock are delicately fashioned into a unique wave pattern. But the Cavalier doesn't let beauty and frills get in the way of rock solid construction and real-world effectiveness. On the contrary, the 3 3/8" embellished drop point blade is forged from tough, corrosion resistant 3Cr13 stainless steel and boasts an edge that's carefully honed to razor sharp. The keen blade deploys in the blink of an eye, thanks to the satiny smooth assisted opening mechanism, which is easily dispatched with just a nudge of the handy flipper. Equally striking and delightfully textured, the handle is also crafted from resilient stainless steel. Stately ravenwood inlays on each side add an ideal finishing touch, with its subtle grain and handsome sable hue. 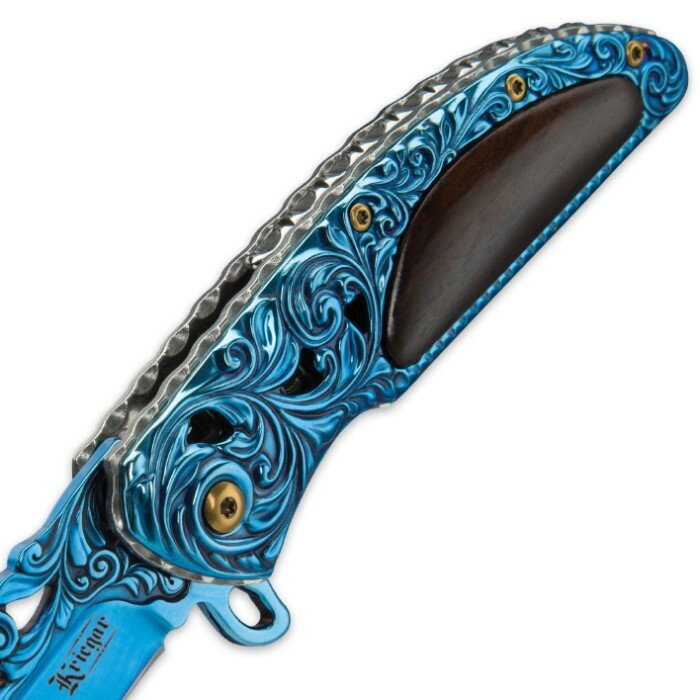 Glittering brass pins and natural silver-colored steel liner beautifully offset the blade and handle's brilliant, iridescent cobalt blue finish. A discreet pocket clip makes this unique folder easy to carry, but with all its graceful allure and sumptuous splendor, the Cavalier Blue is equally perfect for display - in a fine knife collection or on its own. It especially looks great when accompanied by its sister folders, the smoky antique black "Cavalier Dusk" and the shimmering golden "Cavalier Gold" (both sold separately). 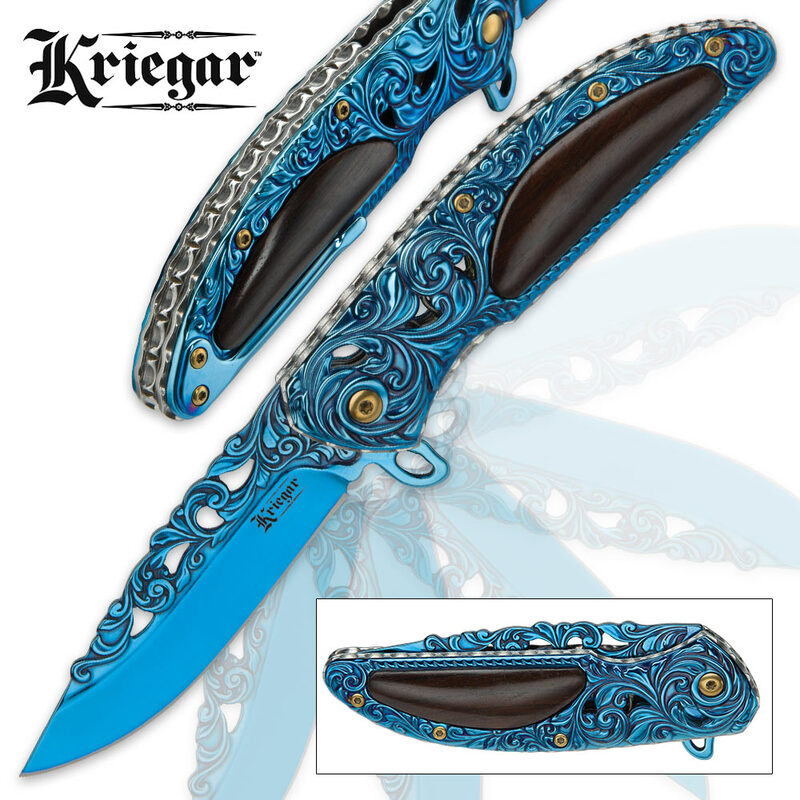 Regardless of how you choose to enjoy it, Kriegar's Cavalier Blue Assisted Opening Pocket Knife is sure to turn heads everywhere you brandish it! For under $15 you can't beat this knife for its good looks and function. It looks and feels like a custom knife costing hundreds of dollars. Blade action is fast, with a precise lock-up, and no blade wobble. The handle is somewhat heavy, but this results in great balance. The blade steel is good, and can be sharpened to shave hairs. The pocket clip is on the small side, but a bigger one would have messed up the aesthetic design of this knife. The pocket clip works, but I usually carry this knife in my jeans pocket, and it is comfortable. I'm a fan of Kriegar knives now! This seems to be a fine quality knife, for the price, and is BOSS looking. Not cheap feeling at all though. I've just purchased a couple of Krieger knives and all are heavy, sturdy and good looking. This knife is so beautiful! Got it for my husband for Christmas. He recently got rid of his knifes so we could have money a few years ago. We ended up losing our house and his job. It was awful. I'm sure he's gonna be so happy to have a knife like this! It's also my favorite color! I purchased this on a whim but it really is a beautiful knife. It is solid and hefty and the blue blade is mirror bright. Great addition for the collector.